Any gun is better than no gun. Such is the premise of carrying a pocket pistol. After all, if you knew you would need a gun on a given day, you'd certainly opt for one bigger than a one you can fit in your pocket. Personally, I'd choose one with a stock and a sling, but since there's no way of knowing if today will be the day you desperately need a firearm and rifles don't exactly make for discreet or practical daily carry, we're pretty much relegated to carrying handguns. Traditionally, handguns have been worn along the waist, on the dominant-side hip, and to this day, this mode of carry is by far the most popular. Waistline carry is relatively comfortable, easily conceals a full-size handgun with a suitable over-garment and, just as importantly, keeps your gun readily accessible. But waistline carry isn't for everyone. For the last several years, the prevalence of concealed carry—coupled with technological advances in firearms and ammunition—has contributed to a surge in popularity of diminutive guns like the Ruger LCP and a resurgence of tried-and-true revolvers like the Smith & Wesson J frame. Smaller calibers like the .380 ACP, once considered impractical for self-defense, are now getting a second look thanks to today's dramatically improved hollowpoint ammunition. The .380 ACP round is more effective than ever, and the subcompact pocket pistol has never been more reliable. Of course, the reliability of snubnose revolvers has never been in question. For those who may be considering carrying a pocket pistol, it's important to have a thorough understanding of the pros and cons of this carry method. First, let's consider some of the advantages to carrying a pocket pistol. Pocket carry is a good carry method, provided you do it correctly. Pocket-carried pistols are lightweight, easy to conceal and convenient to bear. Pocket pistol carry doesn't require the use of an over-garment, nor will you have to endure the discomfort sometimes associated with waistline carry, particularly with extended periods of sitting. A small pocket pistol can be easily slipped into a pocket regardless of weather conditions and takes virtually no time to don. The convenience of pocket carry means you'll probably carry your gun more often. Even when carrying a pocket pistol, however, there are a few clothing-related issues to consider. First, you'll want to wear pants substantial enough both to accommodate the weight of your gun and to mask the outline of your holstered gun to some degree. Jeans are ideal, dress pants might work, and fortunately, yoga pants don't have pockets. Wear pants with a pocket opening wide enough to allow you to access your pocket pistol easily. Even though you won't need a belt to attach your holster to, wearing a belt with pocket carry is still a good idea because it helps prevent the weight of your holstered pocket pistol from causing your pants to sag, which could garner unwanted attention. You can also tote a small pistol in a cargo pocket of your pants or shorts. Cargo pockets are larger, and therefore it is easier to get to your gun. But it's also more likely your holster will move in your pocket in such a way that your pocket pistol is not properly oriented. Also, since cargo pockets tend to be so much bigger than a front pants pocket, having the holster adhere to the pocket during your draw stroke is more problematic. In cold weather, coat pocket carry may be a viable option. This is certainly a specialized carry method, often incorporating a double-action snubnose revolver. If you're using a snubnose revolver, you can get away without using a holster because of the heavy, long double-action trigger and because there's no slide to get bound up inside the pocket. The idea here is you could actually shoot through your coat pocket without drawing because you can orient the gun parallel to the ground while in the coat pocket. If you're going to carry in a pocket, get a holster designed for the purpose, such as this DeSantis Nemesis. It's a safe way to carry, and the holster will stay in the pocket when you draw. If you're carrying a semiauto pocket pistol in that coat pocket, you're going to have to use a holster, and of course, you won't be shooting without first drawing the pistol out of the holster and out of the pocket. Despite its advantages, pocket pistol carry is not without shortcomings. While smaller pocket pistols are easier to conceal, they are proportionately more difficult to shoot. The shorter barrel and reduced sight radius can impede accuracy, and the reduced weight and smaller grip can make a pocket gun more difficult to control during recoil. The latter translates to slower shot-to-shot recovery, which is a real problem considering one handgun round is seldom sufficient to incapacitate an assailant immediately. Pocket pistols not only are more difficult to shoot than full-size guns, but they also tend to have a lower ammunition capacity, especially when compared to a full-size, double-stack pistol. And even though small-caliber bullets are more effective than ever, they are still less effective in comparison to larger rounds. A pocket-carried pistol is much more difficult to get to in a hurry than a gun carried along your waist. Therefore, when faced with an unexpected threat, acquiring a proper shooting grip and drawing your pocket carry gun is easier said than done. However, if you have some indication that trouble is afoot, pocket pistol carry allows you to nonchalantly grip your handgun while it's still in your pocket. Establishing a shooting grip preemptively, while your gun is still in your pocket, helps you maintain the ever-critical element of surprise. With your grip already in place, you're able to bring your gun into play in the blink of an eye. And if you determine the potential assailant doesn't actually pose a threat, your gun can remain tucked away in your pocket with no one the wiser. Snubnose revolvers have long been popular for pocket carry because of their reliability. Hammerless models like this Smith & Wesson Model 442 are preferred by many because there's less to snag on the draw. If you decide to carry a pocket pistol in your pants, you need to use a holster specifically designed for pocket carry. A good pocket holster helps break up the outline of your gun so it doesn't print through the fabric of your pants, and it keeps the pocket pistol oriented so that when you reach into your pocket, it is the grip and not the barrel or the slide that you grab ahold of. There are many types of holsters available for pocket carry. Some rely on a rubberized texture to adhere to the lining of your pocket during your draw stroke, while others are shaped specifically to snag on your pocket as you draw your gun. Be sure to practice drawing your unloaded gun from your holster with whatever pants you plan to use for pocket carry. You may have to modify your draw stroke slightly. For instance, if the back of the holster is designed to snag on your pocket, you might have to pull the gun back before drawing it from your pocket. The last thing you need when drawing your pocket gun is for the holster to come out of your pocket with it. Another important point is to avoid carrying anything else in the pocket containing your gun and holster. Keys or other objects in the pocket can make it more difficult to get to your gun and could potentially enter the trigger guard, resulting in an unintended discharge. Your gun firing unintentionally is never a good thing, but it's particularly bad when it's in your pocket. After evaluating the pros and cons of pocket carry, if you decide to give it a go, you'll need to select an appropriate handgun. The first question you'll have to answer is: "Pistol or revolver?" Pistols tend to be slimmer than revolvers because there's no cylinder. And pistols usually have lighter, smoother triggers than revolvers, which enables most people to shoot them more accurately. A pocket pistol is typically chambered in .380 ACP (although 9mm versions are becoming more prevalent) while pocket-carried revolvers are commonly chambered in .38 Special. Small semiautos are great as well because they're so flat and compact. The addition of a laser is a good idea for either revolver or auto, and some guns like this Ruger come from the factory with one. The weight of a snubnose revolver chambered in .357 Magnum renders it a less popular choice than a .38 Special such as the Smith & Wesson Model 442, which weighs a mere 15 ounces empty. The Ruger LCP on the other hand, weighs just 9.65 ounces, and its 6+1 magazine capacity gives you two more rounds with a standard five-shot snubnose revolver. Revolvers are legendary for their reliability. While pocket pistols can be finicky when it comes to chambering hollowpoint ammunition, a revolver will fire all types of ammunition without missing a beat. Also, revolvers are all but impervious to the dust and lint inherent with pocket carry. A buildup of such debris can wreak havoc on a semiautomatic pistol. Pistols are faster to reload, but the manual of arms for a revolver couldn't be any simpler. The only malfunction clearance you need to know should your loaded revolver fail to fire is to pull the trigger again. Pistols designed for pocket carry usually have rounded edges to facilitate a smooth draw from your pocket. Similarly, many snubnose revolvers intended for pocket carry are hammerless or have a shrouded hammer so there's nothing to snag on the lining of your pocket and foul your draw stroke. Of course, the main advantage of having a revolver with an external hammer is the ability to fire in single action, where the trigger press is significantly shorter and lighter for enhanced accuracy. An external hammer on your snubnose revolver isn't necessarily a deal-breaker when it comes to pocket carry. 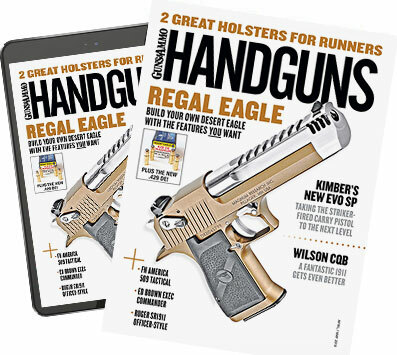 In fact, firearms instructor and author Massad Ayoob offers a simple solution for snag-free draws from the pocket with a revolver equipped with an external hammer. As you reach into your pocket, place your thumb on top of the hammer. Not only does this prevent the hammer from hanging up on your pocket lining, but also it reduces the width of your grip, which makes reaching into and drawing from your pocket that much easier. One of the downsides to pocket carry is gun size. Tiny pistols and revolvers don't provide a lot of grip to hang onto, reducing your ability to control the gun for follow-up shots. So it's even more important to practice. Although few would argue pocket guns are designed for long-range accuracy, with practice they can be surprisingly accurate. Of course, what you're capable of doing under ideal conditions at the range and what you are capable of doing during a gunfight are not necessarily the same. Adding a laser to your pocket pistol can greatly increase your effective range. In addition, a laser enables you to fire from behind cover with little of your head exposed. A properly zeroed laser combined with a smooth and steady trigger press can result in pinpoint accuracy. But accuracy isn't the only benefit derived from the use of the laser. With practice, a laser can dramatically increase the speed at which you can deliver accurate fire because of a simplified aiming process. Rather than having to focus on the front sight, the rear sight and the threat, a laser enables you to simply get the dot on the target and press the trigger. Since we know that when faced with a deadly threat we will focus on that threat, not having to take our eyes off the threat to align the sights is a tremendous advantage. A laser can also give you a psychological edge. When a would-be assailant sees the telltale green or red dot on a portion of his anatomy he doesn't want shot, there's a chance he'll reconsider his actions and either comply or flee. Of course, as a self-defense-minded citizen, this is a win-win scenario for you. Pocket pistol carry is not my primary mode of concealed carry. I prefer waistline carry because it affords me easier access to my gun. I'm usually willing to dress in such a way that I can conceal a compact semiautomatic pistol with an inside-the-waistband holster. However, when the uniform of the day is a T-shirt, shorts and flip-flops, I'm quite content slipping a holstered subcompact pistol or snubnosed revolver in my pocket. After all, any gun is better than no gun.